Getting your app noticed on the App Store isn't easy, but we're here to help! From market research to app localization, check out the ultimate guide to App Store Optimization for localized apps. You’re missing out on a huge slice of the pie if your app isn’t localized for different worldwide markets. Smartphone users spend around 85% of their time using apps on their phones, rather than browsing the net. But your app needs to be extremely well thought out in terms of functionality, usability and localization. Competition in this high-growth area is burgeoning daily as everyone clamors to join the app party. So, there’s no room for a sloppy foreign market version. If you produce time management software, fitness programs, or making white noise for babies, you should probably focus on your key business. Call in an expert team for your app localization. Once you’ve selected the right partner, App Store Optimization (ASO) needs to be factored in from the start. If you want your app to be seen among the millions (actually, billions!) 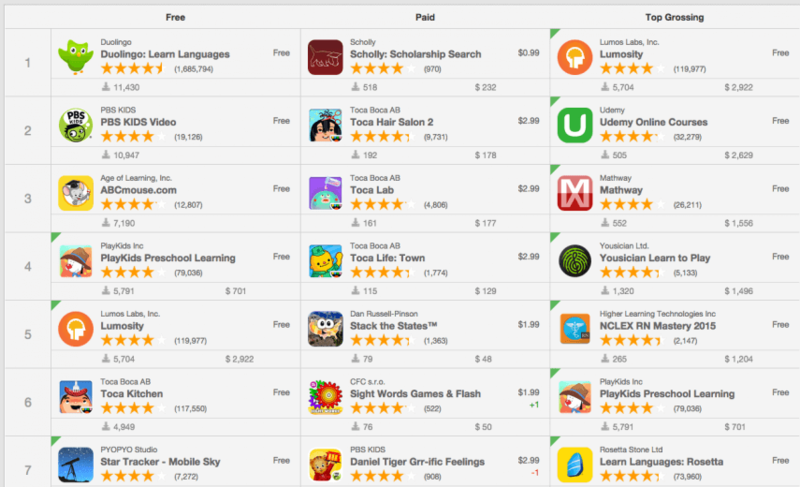 of others in the App Store, ignore ASO at your peril. As you’ve guessed by now, App Store Optimization (ASO) is a lot like Search Engine Optimization (SEO). The main common thread between the two lies in the concept of content optimization. You want to make sure that your localized app’s assets are optimized, which basically means that you make the most out of them. Your app’s content, descriptions, text and images should be primed to gain more visibility. What does more visibility lead to? Greater downloads. What do more downloads mean? Bigger sales. After all, what’s the point of styling your hair and putting on your best suit if you’re going to stay at home? Why waste time and resources designing the perfect app, if it’s going to be the wallflower at the party? 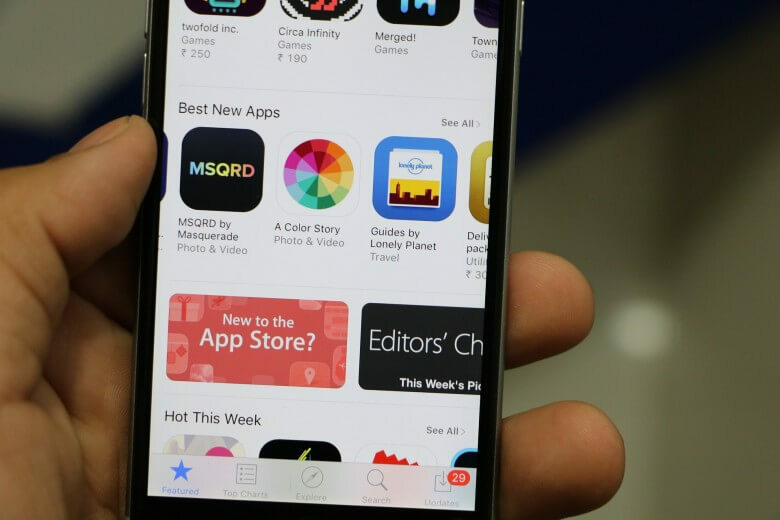 App Store Optimization (ASO) is a way of ensuring that your app meets ranking criteria and rises to the top of search results in the App Store or Google Play. If you know that customers are looking for a weight loss app and you haven’t included the keywords “weight loss”, you’re going to flunk your first ASO class. But if you’ve primed your app for iOS and Android in your home country (good for you! ), you’ll also need to do the same for your localized app. Why? Because they don’t say “weight loss” the same way in Colombia, France, or Morocco. Users won’t be searching for the same terms. Even if your app is nicely localized to respect cultures, languages and ideology, if you haven’t concentrated on international ASO for both platforms, then you’ve failed your second class. It might should like a lot of hard work, but if you consider your foreign language clients at all times, you’ll maximize your sales and ROI. Knowing your customer is pretty well covered in Marketing 101, but it’s super important when it comes to app localization. After all, if you don’t know and respect your foreign clients’ cultures, how can you design an app to meet their needs? A well planned ASO strategy revolves around knowing your customers well in their different markets. Which means that if you’re not au fait with the lingo used on the streets of Colombo, or the local slang in the gin joints of Paris, you’d better start finding out. App localization is about so much more than simply translating your texts. 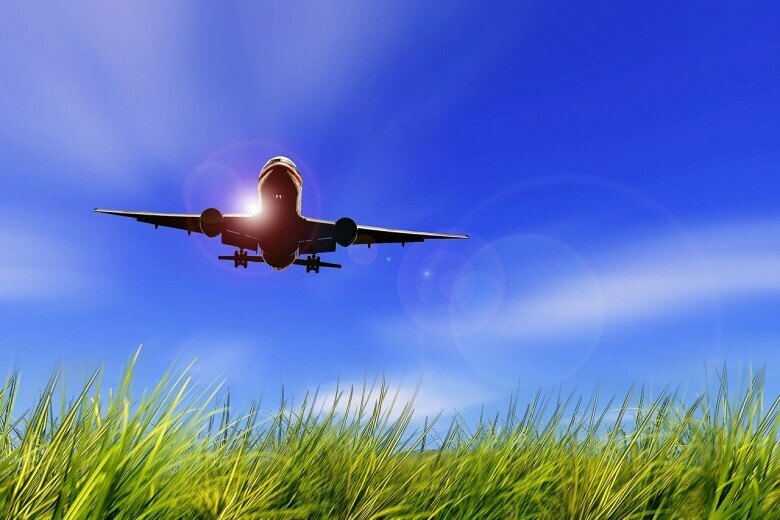 You have to discover the keywords and search terms that your foreign customers use. You’ll also need to know that these vary over countries that speak the same language. The Spanish in Spain isn’t the same as the Spanish in Argentina or Peru. The French in France varies greatly from that used in parts of northern Africa — and so on. Find out how local people speak and how they would describe your app. Then use this vital information in your localized descriptions. How you do this will depend on your budget and timeframe. It would be pretty awesome to take a sabbatical and travel to the markets you want to compete in and carry out firsthand research. But if you don’t have the time or your boss won’t write that into your app localization budget, you’ll need to work with highly skilled native translators. Put together a team of people who know your industry in each place you want to do business. App localization begins and ends with your customers, and app store optimization naturally follows that trend. Another textbook lesson, but an essential one (there’s a reason they’ve written books about it). Knowing your competition is essential, especially when it comes to app localization. Not only are you competing with other international companies, but you’re also battling it out with local apps that are killing it in their home market. Spy on them and find out what keywords they’re competing for, how high the competition is for certain search terms, and if you should compete for the same ones, or not. See what colors and images your competitors are using for their icons, so you get an essence of what’s working and what isn’t. Also, so that you can design your app’s icon to be original and stand out from the crowd. More on that later. Choosing the right name for your app is fundamental. Your name will have a huge effect on how easily it can be translated and localized for international markets. In some cases, you won’t need to translate your name, if your app has an invented or arbitrary name, like “Skype” or “Flickr.” But if you choose a generic name for your app, let’s say “weight loss app” – you’ll a harder time getting the translation and localization just right. You may decide not to translate the name of your app, as you can risk diluting your brand. As with so many things in life, less is more, so keep your app’s name short, sweet and to the point. You can include your keywords in the app’s title, if your company or app name don’t involve a relevant keyword. If translating your app’s name is off the table, instead, you’ll need to optimize your app’s content and embed keywords in the title. This will give potential users a clearer idea of what your app is about and why they should download it. Apps with at least one relevant keyword in the title rank 10.3% higher than apps without keywords in the title. Take a look at the example below. You can see that apps like Duolingo, Scholly, Udemy, Rosetta Stone Ltd, and more, make use of their titles to add in a keyword and describe their app. Remember to keep in mind the right length for your title. If you’re familiar with SEO, you’ll know all about meta data. The same applies in app store optimization. In the App Store, titles are normally truncated (spaces included) at the 23rd character. In Google Play, you have a little more room, as truncation occurs after the 30thcharacter. Downloaded on a mobile device, the title will be cut off at 11 and 14 characters. The moral of the story? Put all your keywords at the front. When it comes to foreign characters, avoid them at all costs! Use only URL-friendly characters within your title. iOS is particularly sensitive to characters. Sometimes iTunes will refer to your app’s numeric ID, if it can’t understand your title or scan for relevant keywords. This will have a negative impact on your ASO strategy, so make sure your characters are friendly to both platforms. You need to tailor your ASO to each operating system, as they both work differently. It’s important to consider that the App Store has a 100-character keyword field limit. This exclusively includes your app’s title and keyword phrases. Taking this into account, when it comes to ASO for iOS, you’ll need to make every character count if you want to maximize the organic traffic for your app. Google Play’s approach to ASO is much more like its approach to SEO, which gives you a lot more room for flexibility. Being Google, it scans your entire description and detects the keywords within. You have up to 4,000 characters to describe your app, but you’ll still need to use them wisely, with the right keyword density. Just as with your web copy, keyword stuffing doesn’t pay off. In fact, it’s important to remember to write for your customers and not for the algorithm. Keyword stuffing will not get you ranked higher and may turn customers away with your repetitive wording. Write a captivating description, but don’t write an essay or a murder-mystery. Remember that people have limited time. They don’t want to be left waiting to find out what the best feature of your app is. They won’t read chunks of text to get to the twist in the tale. So, don’t keep it a secret. Put all your best information up front. Go against all the first date advice your Mom gave you and give everything away at once. Even if Google Play scans your entire description, that doesn’t mean that your customers will read it. Once you have your description optimized and ready, you’ll need to get it translated. But, depending on the type of text you need translated, it may be better to work with translators who can apply techniques of transcreation. Transcreation allows your translators the freedom to take local keywords and search terms and come up with a description that is both optimized and appealing to local customers. They will still stay faithful to the original, but where certain phrases and idioms can’t be translated world for word, they will adapt them for the target audience. Using the right translation management software, your programmers will be able to give your translators context, so that they won’t be working string by string. This is particularly important in app localization, where they need to see screenshots to understand the whole picture easily. You can also give your translators a list of keywords to include, to ensure maximum visibility. They say a picture is worth a thousand words. There’s no specific equation when it comes to App Store Optimization, and your images will not affect your search ranking. However, adding screenshots to your description will increase your downloads. Clear and relevant images showing how your app works and how user-friendly it is will allow the user to visualize themselves using your app. Remember the strapped for time issue? People like looking at pictures as they can glean how easily they will be able to use your app and if it looks like a fit for them. iOS allows up to five screenshots for an iOS app, and Android allows eight, but only your first two or three screenshots will be displayed upload page load. This means that you need to put you most effective ones first. Some companies decide to use simple screenshots that show how the app works, while others combine strong imagery with screenshots. Uber and WhatsApp are among the most popular apps downloaded in 2016. 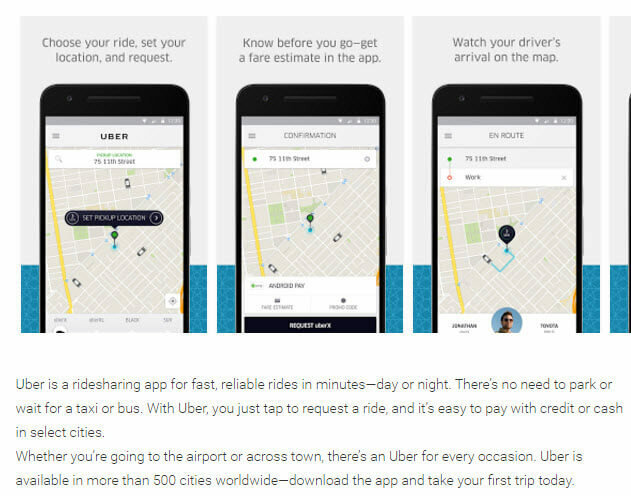 In Uber’s description for Google Play, they use three carefully chosen screen shots that clearly show how their app works. Simple and functional. Notice how the fourth screenshot is cut off on Google Play. WhatsApp also makes careful use of their clearest screenshots. 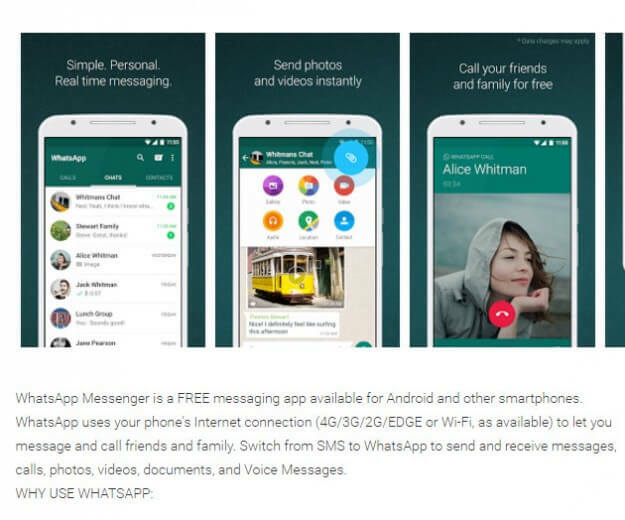 But, as many people already know what WhatsApp is about, they go for a combination of screenshots and imagery for high impact. Both descriptions are less than 100 words for the first page and each one is used with precision. So, always use the screenshots that will be more effective and convey meaning to your audience. If you have any updates, this is the place to show them, and also display the pages where your users spend most of their time. Don’t just show the slides that you think look prettier, as a photo may not be as useful as seeing the app in progress. Try A/B testing with different screenshots to see which ones encourage the most downloads. As with everything else in app localization, ensure that the screenshots you select are appropriate for each market. Have the images and units of measurement correctly displayed, as well as the text translated and localized. Many apps include units of measurement. Whether it’s a pregnancy app tracking the size of the user’s baby, a fitness app monitoring their progress, or a money app recording spending. You’ll need to display measurements and weights the local way. 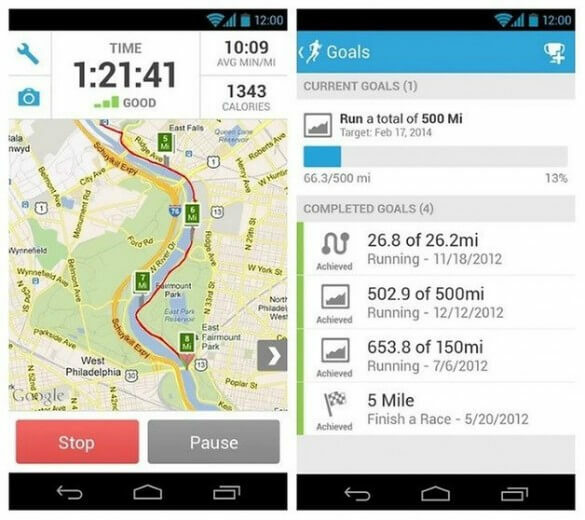 Check out these screenshots for Android from Runkeeper, a popular running app. You can see that the English version gives distances in miles and the French version uses kilometers, as well as other translated assets. 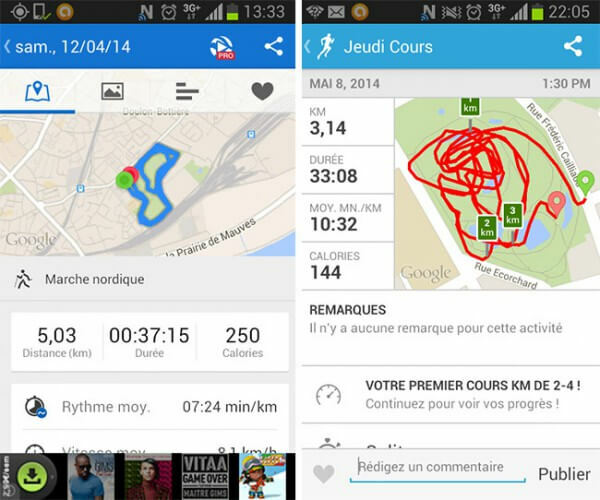 An app like Runkeeper, which relies on local maps, has run into some problems with its iOS users. Many people believe that Apple Maps are not as accurate as Google Maps and say that Runkeeper works better with Google Maps. Sometimes you may find that your app is easier to tailor to Android. In other cases, iOS’s XCode and its “base internationalization” feature may be your developers’ first choice. Obviously, if you want to maximize your sales, you’ll need to develop your app for both Android and iOS, especially when it comes to app localization. Some countries, like Japan and South Korea have a heavy preference for Android, whereas China is dominated by iOS. So, if you find that certain countries are determined to stick with one system over the other, you’ll need to figure out how to localize your app for both platforms. They always say never judge a book by its cover. But, I bet you have once or twice. It’s sad, but true. In a world full of visual clutter demanding our attention, your app’s icon will be one of many in the App Store. It’s important that it stands out – for the right reasons. You should avoid using text in your icon, especially when it comes to app localization. It will either not show or display blurry when reduced to iOS and Android sizes. It may also be impossible to include translated text in small dimensions with languages that take up more space. If you’re going to take your app to the middle east, be especially careful about researching the appropriateness of your icon. For example, while the “thumbs up” sign may be almost universally accepted, in Iran, it’s one of the most offensive gestures you can make. The suitability of your app’s icons, as well as originality will improve your ranking, visibility and chances of being featured by the App Store or Google Play. Remember that designing your icons for both platforms is different. Apple icons have rounded edges, whereas for Android they are squared. iOS requires icons to be 1024×1024, which will then be reduced to as small as 66×66, depending on the device. Android asks for images to be delivered at 512×512, to later be reduced to sometimes as small as 22×22. Most popular apps have bright, easily distinguishable icons, think WhatsApp, Twitter and Facebook. Research your competition and see what colors they are using, so that your app icon is easily distinguishable. Driving traffic to your listing is about taking ASO out of the App Store. If you’re familiar with a solid SEO backlink strategy, start doing the same for your listing. Get trustworthy and popular sites to review your app and link to it. The more links you get (and traffic you generate), the higher your ranking will be. Advertise on social media and invest in PPC. Build a strong online presence for your app and try to get it reviewed and adopted by influencers in your industry. The App Store takes reviews into account when adjusting its ranking and positive reviews will improve your visibility on both Android and iOS. Many users read app reviews before deciding to download them or, at the very least, check the star rating. If yours isn’t good, they won’t bother downloading your app in the first place. How do you get reviews? Make sure that you consider your user experience at all times. No one wants to be bothered with popups the instant they download your app. Not only will they not have had the chance to check your app out, but it may encourage them to delete it, rather than rate it. It’s better to set a prompt asking for a review a couple of weeks after download. You may decide to hold a competition or encourage reviews with free products or incentives. Be sure to check the legislation for competitions while researching your app localization strategy. Some countries have strict requirements when it comes to these types of promotions. App store optimization, just like app localization, should be factored in from the very beginning. But, if you have a successful app on your hands in your home market, with the right team, strategy and ASO techniques, you can make your app a global success. Research your customers and competition well in every market you launch. Respect their cultures, understand their needs and tailor your strategy to your customers, as well as Android and iOS applications. 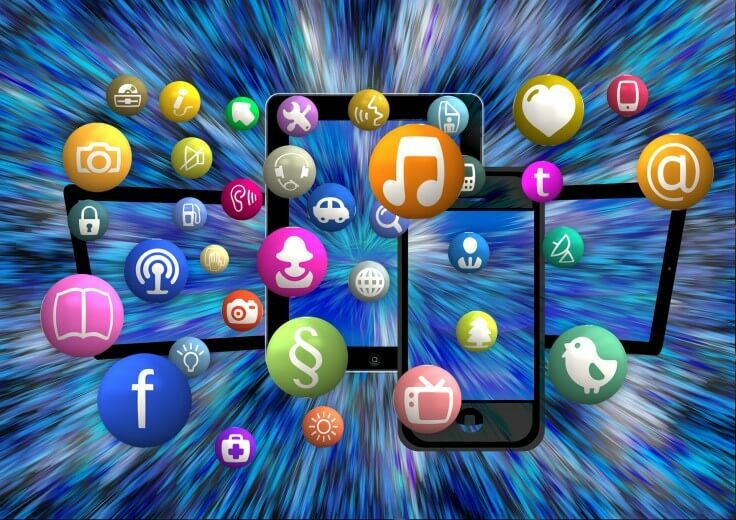 Follow these tips and you’ll soon be outranking even the most popular apps. App Store Optimization (ASO) for mobile apps is the key to get your app discovered for certain keywords in search results. So if you are counting on organic downloads and improving your visibility through search results, then ASO is a MUST for you. ASO can increase your app visibility in search results. Over 10 years of experience in Marketing, Strategic Planning, Product- and Project Management, as well as B2B and B2C Client and partner Relation Management. -	Entrepreneurial approach managing diverse international teams and cross-functional communications, providing motivation and strategic business ideas. -	Ability to play multiple roles with broad range of both analytical and creative skills in business development, team management, product management, and operations. -	Competent in a diverse set of rapidly changing technologies and business strategies that demand attention to detail and strong, long-term vision.